First Visit to the New Library | From the Seasonally Occupied Territories . . . This past Saturday, a week after its grand reopening, I paid a visit to the West Tisbury Free Public Library. Wow. Not to worry: I’ve got pictures. Scroll on down; have a look. I didn’t get to the grand opening, despite my best intentions. That morning my old digital camera died. How could I possibly blog about the grand opening without pictures? I spent the morning web-researching digital cameras. Multitudinous options do a time sink make, even though I knew what I wanted: something like my old Canon PowerShot A590, only newer. No sooner had I ordered a PowerShot A4000 from Newegg.com and — this is the key — bleated my triumph on Facebook than a friend in Vineyard Haven posted a comment: “Wait! Wait!” She had a barely used PowerShot A2400 she wanted to sell. So instead of going to the opening, I researched cameras and visited with my friend. A week later, the new camera and I finally got to the library. Ceremonial hardhats at the groundbreaking party, December 2012. At first glance the new façade doesn’t look all that different from the old. The shingles are new, the entrance has moved to the left, and the porch is wider and deeper. Now you can return books after hours without getting soaked. The walkway that bisects the parking lot and the area at the foot of the steps are studded with commemorative bricks. For a donation of $125 you could say whatever you wanted — within reason, of course — on a brick. Once through the front door I knew for absolute certain I wasn’t in Kansas anymore. In the center is what I still sometimes call the card catalogue. 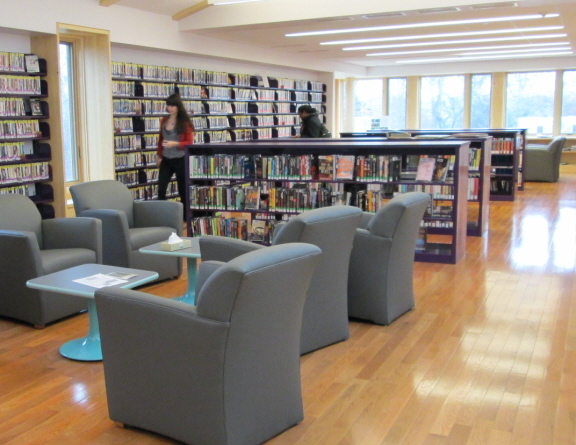 From those terminals you can locate any book, DVD, journal, etc., etc., in the CLAMS (Cape Libraries Automated Materials Sharing) network, to which the West Tisbury library belongs. See those names up above? OK, it’s hard to tell that they’re names, a whole square of them. The names of contributors, year-round and seasonal residents, from West Tisbury and the other island towns. Instead of one megabucks donor’s name on the outside, we’ve got hundreds and hundreds of names on the wall and on the bricks. Through the door to the left is the children’s section. The door on the right opens into the new program room. I’ve been in love with the program room since I first saw it in the plans and computer simulations. In the old library, readings, lectures, concerts, and workshops were held in the periodical room. Tables had to be moved to set up chairs. The audience was fragmented by shelving. The backdrop for every singer and speaker was floor-to-ceiling magazine shelves. Maybe three players could occupy the “stage” at any one time. The new dedicated program room is ready for almost anything. And it’s beautiful. The new library has lots and lots of wall space to hang artwork on. Currently featured are the tapestries of West Tisbury artist Julia Mitchell. I doubt the chairs were chosen to coordinate with the tapestries, but it sure looks like it, doesn’t it? The main floor reading area is big, but it’s been arranged in nooks so it doesn’t feel overwhelming. From the light streaming in the windows and glowing on the hardwood floors, you’d never know that Saturday afternoon was overcast and rainy. In the old library, the staff had no office space to call its own. They worked behind the circulation desk. Now they’ve got room to work and store stuff in. The new offices have plate-glass windows on the inside so the staffers aren’t cut off from the life of the library. There are also a couple of small conference rooms, suitable for classes, meetings, or, well, conferences. Of course the new library has rows upon rows of bookshelves. The new shelves are purple, as are some of the floors. Guess what the Vineyard’s team colors are? White and . . . ? You got it. And here it is again, with a Julia Mitchell tapestry at the top. That’s the young adult room in the back, a cozy, secluded place for reading, studying, or just hanging out. West Tisbury’s library has long been a bustling place — the heart of the community, some say, and with good reason. As plans for the renovation and expansion got under way, some townsfolk expressed apprehension that the small-town community feeling would get lost in the shuffle. I wondered too, but I also had fantasies of what could happen in the new program room that couldn’t have fit in the old library. Strolling around the new library, I glimpsed possibilities everywhere. The new library really is awesome. This entry was posted in Martha's Vineyard, public life and tagged community, West Tisbury Free Public Library. Bookmark the permalink. What’s way cool about the library is that it has a tokonoma. How many libraries have one of those? I had to look up “tokonoma.” Is the little recessed area where the “card catalogue” is a tokonoma? If not, I will have to look again. I was too enthralled by the program room and the purple floors and the staircase. My favorite moment, opening day, was watching one person actually weeping real tears of joy. (Who CRIES about a municipal facility?) Can’t wait till a year from now, when the “new” wears off and it starts to feel lived-in. A really sweet tribute. Thanks, Susanna! After Liz quit her job and we become a one-income family, Liz cut back on buying new books and — big step for her — got a library card. We’ve discovered movie DVDs and have gorged on mini film festivals. Loved the art work at the West Tisbury Free Public Library. There was always art on exhibit at the unrenovated, unexpanded library, but you had to squeeze around chairs and tables to look at it. The possibilities in the new space are — maybe not infinite, but at least very big.